My mom used to tell me 'quality over quantity' back in high school when I was dating girls. Of course that meant that I completely ignored her and would date a girl if she was breathing. What in the hell would you expect an awkward 17 year old boy to do?! I've heard that same sentence used in lots of other ways too: when writing, when speaking, when eating, when working out, and so on. What does that have to do with DevOps? As I continue on my journey through the DevOps movement, it seems to me that we have a bit of a conflict here - the goal is to release at a higher velocity (quantity) with well tested code (quality). Is this really possible? I know that some of the 'high-performers' like Amazon, Etsy, Flickr and Netflix are proving that it can be accomplished, but I keep wondering if slowing down can actually help us deliver more extraordinary things. The lesson we all can learn here is don’t get stuck trying to get it right the first time. Instead, start making one or two things everyday. In the auto industry, BMW’s business model of selling well-crafted luxury cars in tiers has become a standard for companies wishing to emphasize product quality. BMW offers its flagship vehicles in three flavors – the compact 3 series, the mid-size 5-series and luxury 7-series – all aimed at different markets. In addition, it sells sporty Mini hatchbacks as well as the ultra-luxurious Rolls-Royce in order to appeal to the lower and higher ends of the pricing spectrum, respectively. BMW’s clear separation of its tiers, all while retaining an aura of overall luxury, was the inspiration for Steve Jobs when he returned to Apple in the late 1990s. At Apple, Jobs mimicked BMW’s tiered pricing system with his computer and iPod lines. BMW and Apple are shining examples that offering a quality product on multiple pricing levels can attract the maximize amount of customers at premium prices. If your product becomes known for its shoddy construction – and due to the Internet, word travels fast – your overall sales will be quickly damaged. 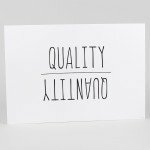 Favoring quality over quantity will increase your company’s reputation and increase product loyalty, which will keep your business sustainable in the long run. I'm not sure there is a right answer and the ideal one is "I want both", but I wonder if it's better slow down and deliver higher quality products or deliver faster to be responsive and iterate continuously. This is not to say I am not a huge proponent of DevOps and the transformational aspects it can have on the culture of IT, but going fast also has a price. What do you think? Is DevOps the secret sauce that allows for us to get quality products faster to market? Do you think it has to be one or the other? I'd love your thoughts.